Welcome to my bedroom renovation tour! 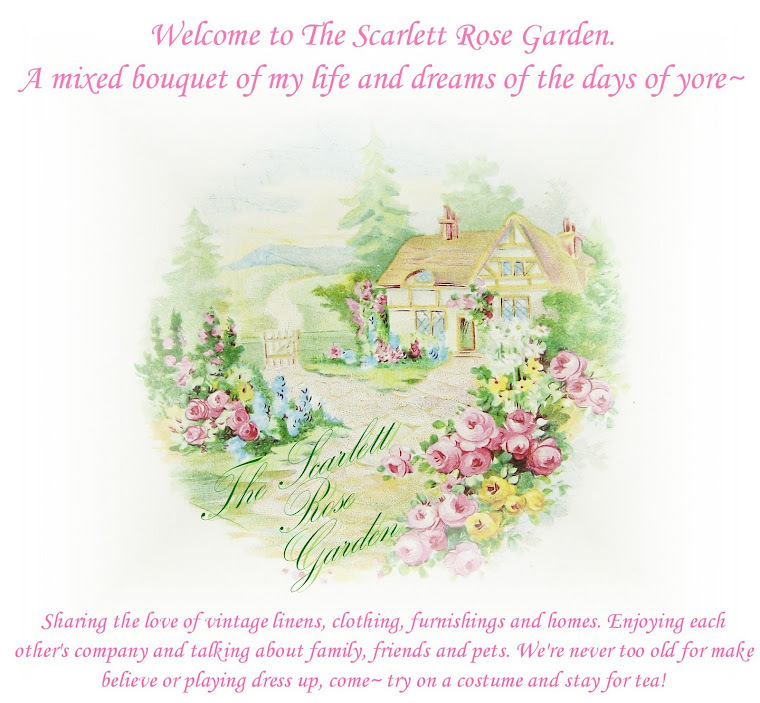 If you've been a Scarlett Rose Garden reader for quite some time now, you may already know that I love vintage, victorian, and french decor. My taste is extremely eclectic and I have a lot of trouble putting rooms together, as if all these different things were meant to be meshed. The bedroom has been a beast. We started on it over a year ago and it's still a work in progress, decor wise. These first few pics are scans, but the only before shots I've got! The room is about 15X15. This is looking through the door, seeing the north and east windows. The window placement in this room makes it hard to arrange furniture. Especially when you have A LOT of furniture. I'm standing by the south window to take this shot of the enclosed chimney in the corner. 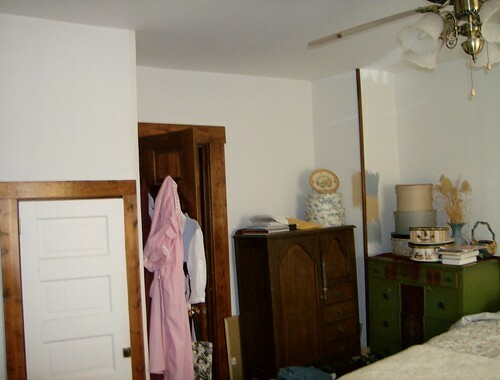 The bedroom door is just to the left. Nice trim on the chimney, eh? Looking at the large east window, and south window. 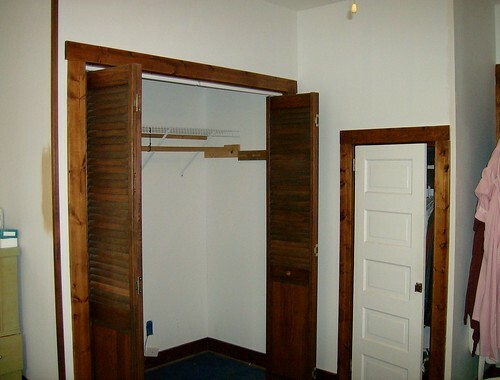 You can also see the built in closet. That went bye-bye. A shot of the Cookie Monster blue carpet at the foot of the built in closet. I was sorting my doll clothes, Rose's on the left and Scarlett's on the right; Rhett's in the middle along with an extra case for whoever needs the room! I'm a bedding hoarder. I love bedding. Funny thing is, I don't like bedding *sets*. I want things to match, but not TOO much. Then I run into trouble, driving myself mad trying to find things that *go*. 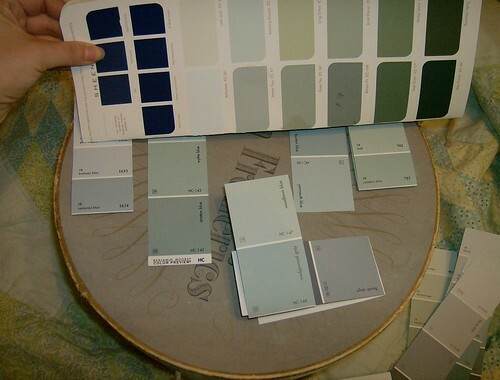 Choosing a paint color for this room was maddening. I wanted something that would go with all of these! But not boring beige, etc. No green, too much green in the house already. This was my first inspiration picture. 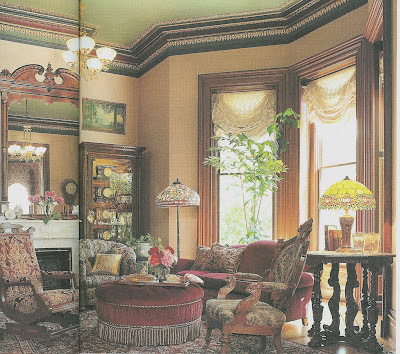 I loved how they painted the ceiling, and had gold crown molding. This is "Romance" bedding from Penney's 6 years ago. I just *had* to have it. It was my first Christmas present from Kevin in this house! 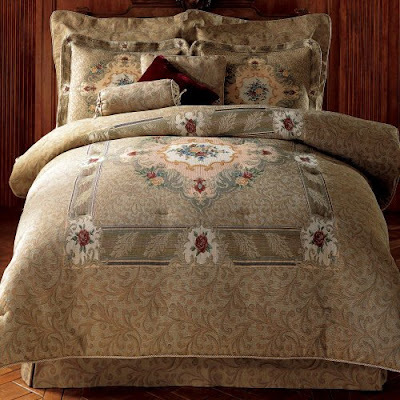 I didn't want the whole set mind you... just got the comforter and two shams. A burgundy velvet dust ruffle would look much better! I thought the inspiration photo above would look great with this. But alas, it's not my only bedding. It's just my *winter* bedding, lol! So next I found this inspiration photo. I just LOVED this one! So much that I bought a gallon of Colony Rose paint and tried it. UGH. I couldn't handle it. It looked way to COUNTRY. 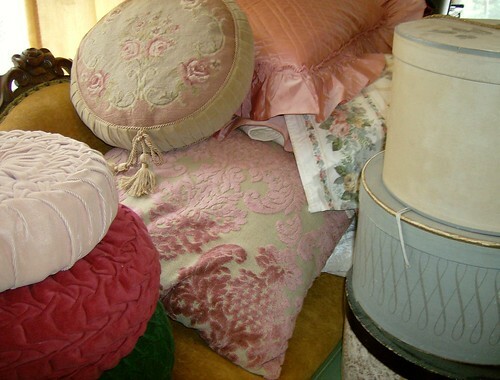 Plus, I must admit I felt sorry for Kevin if he had to sleep in a mauve room~ even tho he told me to go for it! 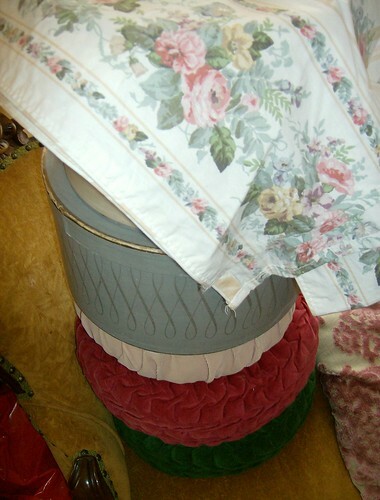 So one day I was looking at some of my pretties and this blue/grey/greenish hatbox REALLY stood out to me. Hmm.... that would be a nice wall color! Yah! That will be great!! 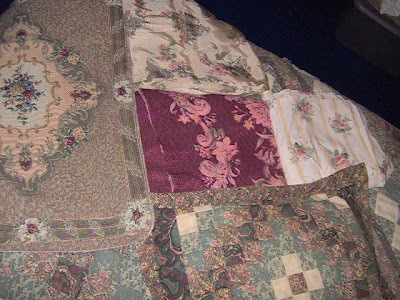 See how it looks with my beloved sheet set that I plan to make something out of one day? 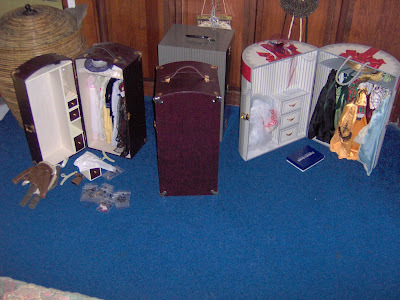 First I took the hatbox to be color matched. It turned out this HORRIBLE battleship grey. Nothing like the box. I guess it was too hard to get a clean match on a 60+ year old dirty box. So then I rounded up a bazillion swatches. It seemed that NONE of them matched. I have an entire HUGE manila envelope full of stupid swatches. 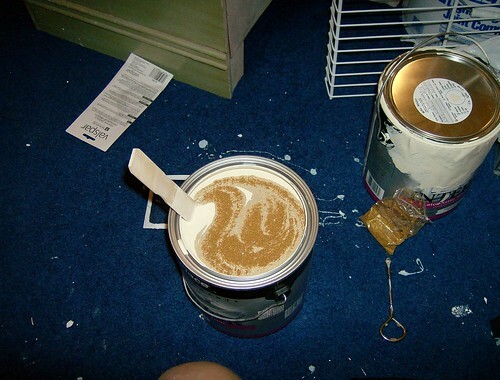 At this point I was leaning towards Behr's Pewter Tray, shown here above the "F" on the box. Now believe me, these colors matched much better in real life. By the way, Fredericks was the designer for the hats in Gone With the Wind, I was excited to find this box! It was pretty actually, but not the *feeling* I was going for in this room. Ok, scratch the grey/blue/green color. 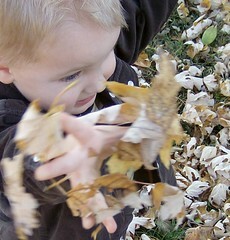 During this time I totally fell in love with http://www.michalnegrin.com/. Her web design, jewelry, and home decor. Ok, this was it!! I printed out a picture for my "worksheet" and went from there. I finally settled on a parchment/golden beige color. Yah. I know, exactly what I didn't want in the first place, right? Well, now I love it. 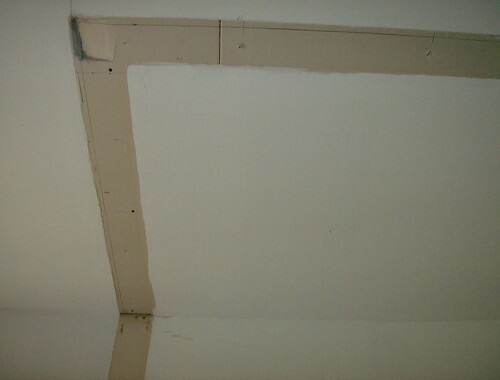 I did a light blue on the ceiling with a hint of green. And guess what, that hat box looks awesome with it! Painted the floors and trim cream. YES. You read that right, painted the wood floors. 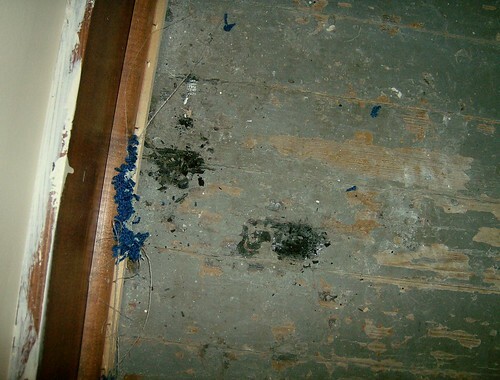 We couldn't afford carpet, and after ripping up the Cookie Monster stuff, we saw charred areas, tire tracks from a motor bike, and a gazillion screws all over! Here's the burned areas. I know there's been at least two fires in this house. You could pick this away just like a log on a campfire. 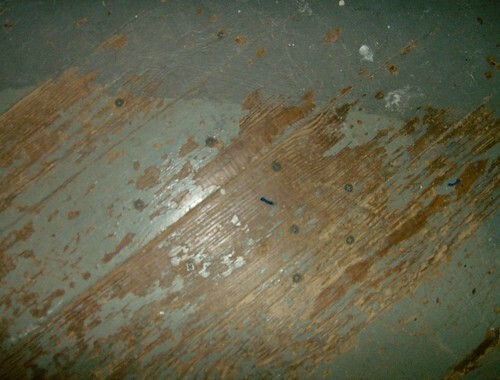 Hmmm.... guess they thought screws would fix the squeeky floors! NOT! They're over the entire floor. 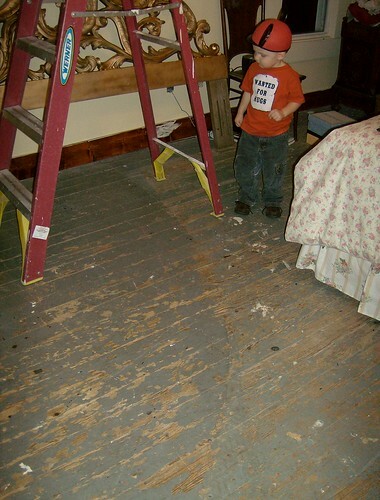 We would've cursed our heads off and probably ruined a sander had we tried to refinish the wood. There had been "trim" on that corner like the chimney as well, and by this point I had already taken it off and started to mud. So much better! Look how grey that stupid hat box looks in this pic! A last look at the closet... ew, more corner trim!! Guess who got to patch and sand where the closet had been? Wow. The room looks SO much better and larger now! Besides, we had to make room for this! Kevin replaced the mirror in the door for me last Christmas! I didn't even notice. I came in the room, LOOKED RIGHT IN THE MIRROR... I took off my heels and started complaining about how fat I looked without them on. He's like, "notice anything?!" DUH. He even had a big red bow on it! This is also a good shot of the painted floor, wall color, and ceiling! I put Granite Crystals from Lowe's in both the wall and ceiling color. We did this in our living room too, and I just LOVE it. You don't see the glitter unless it's dark and a lamp or candle is lit. Very soft and fine... romantic! 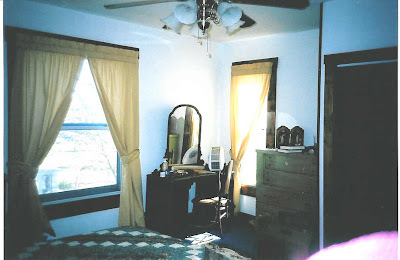 I have been stalling on showing you the bedroom because I wanted it to be totally done. I wanted that whole WOW factor, ya know? Well, it's taking forever and that's just not gonna happen soon. So I hope you've enjoyed what you've seen so far. If I could change one more thing in this room it would be to put in a chandelier instead of the ceiling fan. 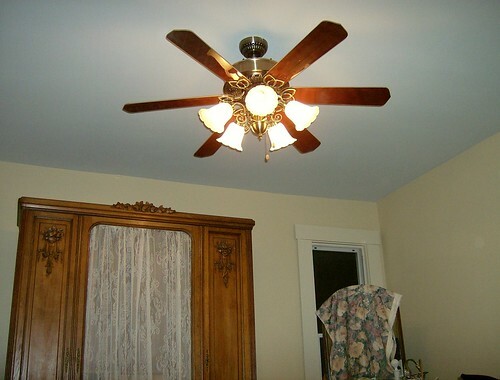 But in this old two story home, this fan is an absolute MUST. It runs at least 70% of the time. At least it is a pretty fan, rather elaborate/victorian looking. We flipped the blades over from oak to cherry and it's much better. I'd best start another post for more of the decor stuff, this is already much too long! 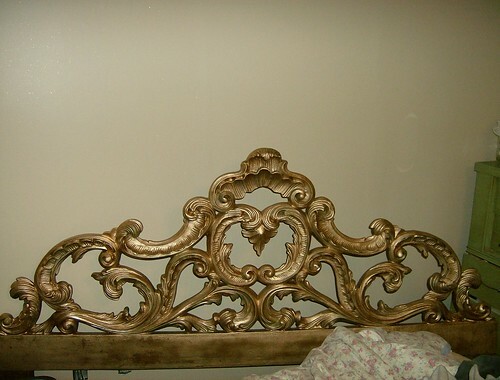 But before I go, I'll share the headboard that I got at a yard sale for $20. It was an ugly walnut shade, made of resin. Gold paint was in order! Unfortunately, we had to cut off those outer-most scrolls as it was a king size and we have a queen. 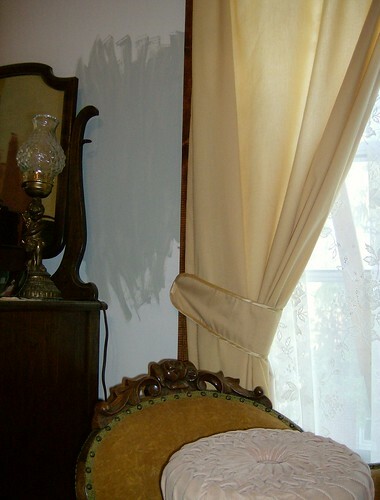 I still want to add molding and a border, etc.... so stay tunned as la boudoir evolves! I can't wait for the big reveal....hurry!!! What a huge difference. It looks so much better! I dyed my hair medium auburn today. it looks great! I've never been a red head before, I like it. WoW! What an amazing transformation you've done already! This is amazing to see. I cannot wait to see it completed! Take your time to get it just the way you like it. I love your inspiration photos...that crown molding is absolutely divine! Really! Wow, What a pair we are. I should show you the drawer full of paint chips and my bedding. I think we were separated at birth. Your wall color and ceiling color are perfect. I am still not sure I got ours right but will never tell DH otherwise lol. Your headboard is wonderful. What a great find. 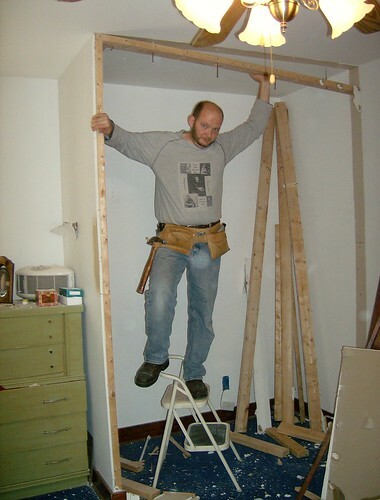 Wow, you guys have done sooooooo much work on just one room! It's coming along great though. Can't wait to see it done!!!!!!! First time on your blog - love your posts. Your house loks full of promise - you really "get stuck in" - keep it up. 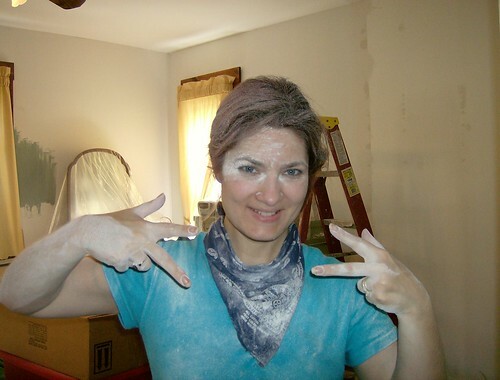 I've followed along on your restoration and decoration, for awhile, Nikki. I admire your hard work. Beautiful beautiful beautiful. Have you had a minute to come by the back porch and see the Elgin-Cottrell house, in Clarksville? I published the house Wed and tomorrow Richard's beautiful shop will make an appearance at the back porch. His home is amazing. I couldn't help but think of you as we toured, last Sunday. Wow, you have done so much. I love to see amazing room transformations such as yours. 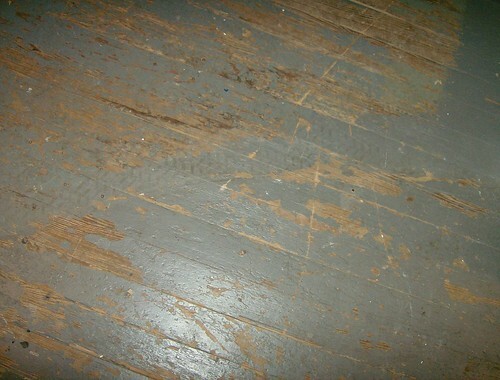 And call me crazy, but I'm incredibly fond of your old wooden blue floor boards. You are such a tease. I know it's hard work refinishing floors! I had nails and a really mad floor refinisher! All ready such a huge difference. i can't wait to see more! BTW, I love the painted floors. 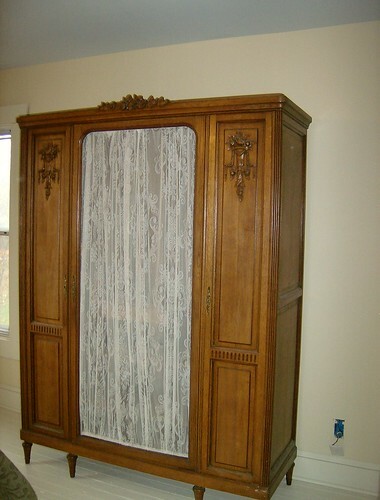 I think I may suggest that to hubby because I'm dying to rip out my blue carpet and expose the wood beneath. Ours are in decent shape but the cost of restoring them and making some repairs is all ready over $1600. Wow! 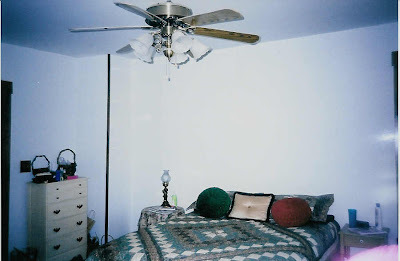 Girl, you and hubby really did a transformation on your bedroom....I love the paint color on the walls and ceiling and floor....and that armoir is so pretty too! You both worked so hard, I can tell....your home is really a labor of love and it looks so beautiful! 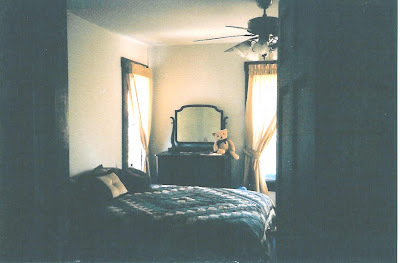 I've been looking through your old posts and when I got to this one, I was so amazed at your bedroom redo. It is gorgeous! 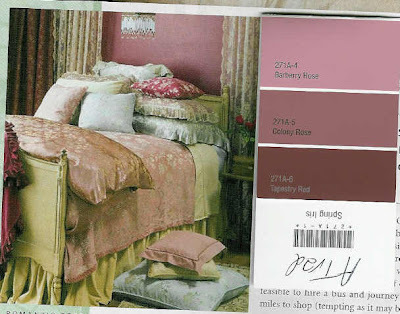 I love the colors that you chose and I looove the bedframe and the armoir! Looks just perfect for you!